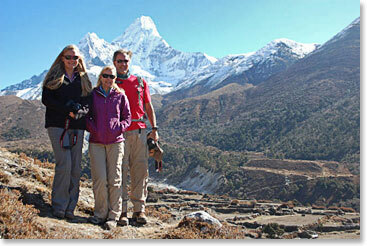 Alyssa, Keely and Scot with one of the most iconic mountain images in the world: Ama Dablam. 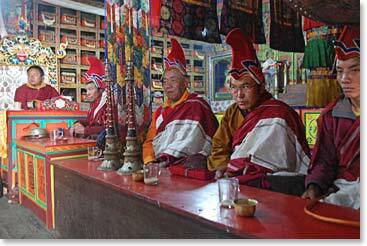 At the Pangboche Monastery we saw lamas conducting a “Pooja” ceremony. Later we visited Lama Geshe, an old friend of Berg Adventures and one of the most revered figures of Khumbu. 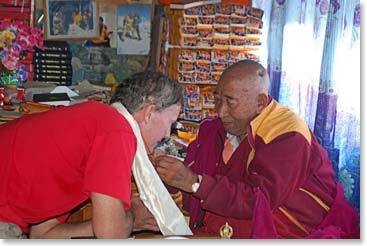 Lama Geshe offers blessing to Keely. 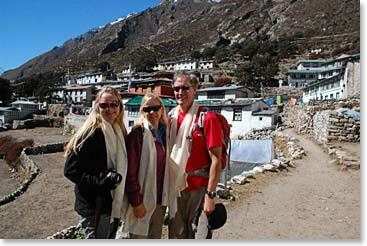 Before we began trekking for Pheriche we paused for a family portrait near the Monastery. The white scarves are our Khata blessings. We had a lovely visit with Yangzing, Ang Temba’s wife, at his lodge in Pangboche. For more beautiful photos and awesome stories from the Sellers family expedition click here for their travel blog.